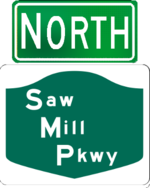 The Saw Mill River Parkway extends the Henry Hudson Parkway into Westchester County, paralleling the Thruway for much of its length. The road is not a full freeway, with many intersections with traffic lighs on the parkway. The parkway was transferred to NYSDOT with the abolition of the East Hudson Parkway Authroity in 1980, and the toll between exits 3 and 4 was removed in 1994.